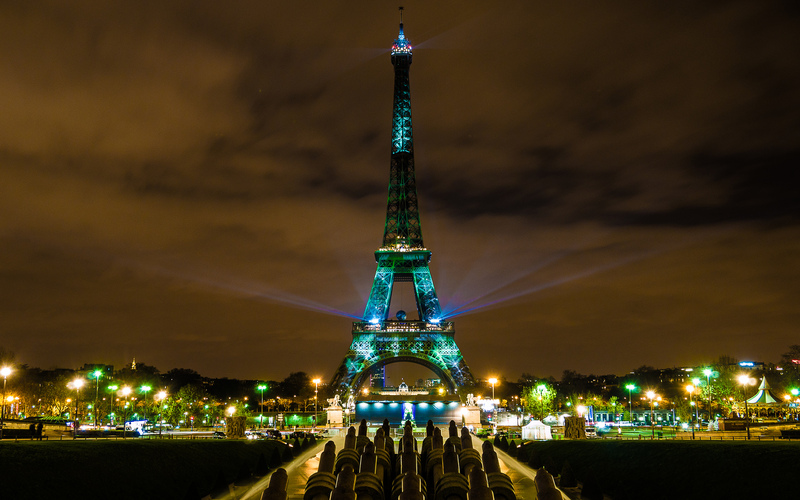 Sciblogs | Is it in the spirit of the Paris Agreement to ratify it with more emissions? Is it in the spirit of the Paris Agreement to ratify it with more emissions? Is the New Zealand Government’s plan to ratify the Paris Agreement in 2016 consistent with a two degrees Celsius (2C) carbon budget? 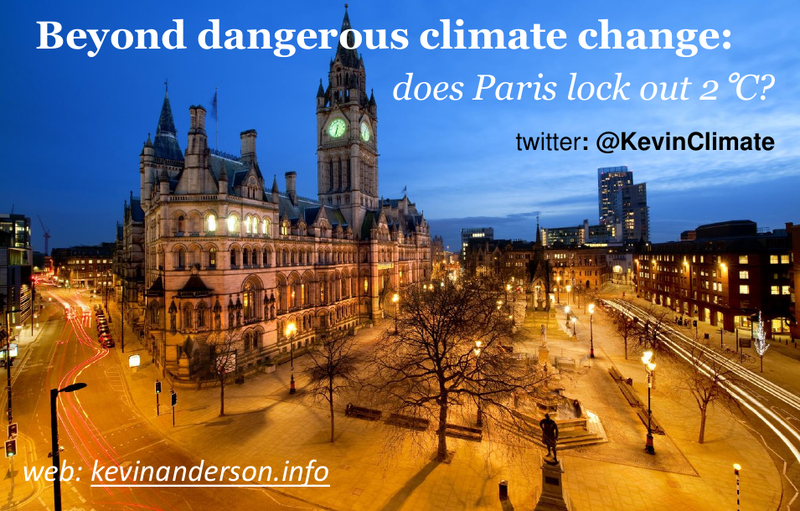 Since the December 2015 Paris Agreement, the British climate scientist Kevin Anderson has given a couple of talks with the title Beyond Dangerous Climate Change: Does Paris Lock-out 2 Degrees? Anderson’s message is that although the Paris Agreement was a diplomatic triumph, it relies on speculative utopian technological fixes (bio-energy carbon capture and storage) in the future in order to reconcile the now extremely limited carbon budgets consistent with the desired 2C (and 1.5C) temperature limits with business-as-usual economics and politics. In other words, the Paris Agreement locks out the 2C target. To set the context, I’ll set out some of the mechanics of what ratification of the Paris Agreement will require in New Zealand. Then in true Kevin Anderson style there will be a look at projected emissions and some graphs. As we know, last month, on 17 August 2016, Minister for Climate Change Issues Paula Bennett announced that New Zealand would ratify the Paris Agreement this year. A cabinet paper from Paula Bennett “Paris Climate Change Agreement – Report back to Cabinet and Approval for Signature” has been on the Ministry for the Environment website since April 2016. “..presenting the agreement and a national interest analysis to Parliament for examination by a select committee, after which the select committee tables a report in the House. After this, legislation may be passed and then New Zealand may ratify the Agreement”. The “Paris Agreement National Interest Analysis” was very briefly open for submissions on the New Zealand Parliament website until 2 September 2016. The Ministry of the Environment has a Paris Agreement webpage. This confirms that once Parliament agrees to ratification (and enacts legislation), the Government will deposit the ‘instrument of ratification’ with the UN Secretary General before the next international UNFCCC climate change meeting in Morocco (COP22) in November 2016. Therefore, some stepping stones are apparent. There will be a Parliamentary Select Committee considering the National Interest Analysis and submissions. That Parliamentary process has its shadow process, the Ministry for the Environment driven, and therefore more Government-controlled, review of the New Zealand Emissions Trading Scheme. Some amending legislation will probably be presented as the outcome of both processes. A crucial point will of course be the detail of this amending legislation. Paula Bennett has stated that the Government has “absolutely no intention of changing our target” (the New Zealand 2030 climate change target), and that the required ‘Paris’ legislation will be nothing major. Therefore, as she stated to Radio New Zealand, the New Zealand Emissions Trading Scheme will only need to be tweaked to meet the commitments under the Paris Agreement. So the amendments will be to the Climate Change Response Act 2002 which is the statute that incorporates the United Nations Framework Convention on Climate Change (UNFCCC) and the Kyoto Protocol into New Zealand law. The UNFCCC is included as the first schedule to the act and the Kyoto Protocol is included as the second schedule. The amendments will probably affect the provisions describing the operation of the New Zealand Emissions Trading Scheme (which has been under review all of 2016). Perhaps the Paris Agreement will be incorporated as a further schedule. The current highly conditional New Zealand INDC (Intended National Determined Contribution), otherwise known as the 2030 climate change target, will become a NDC National Determined Contribution. Professor Ralph Sims notes that the NDCs “will need to be based largely on domestic mitigation actions” but “they are not legally binding”. Ralph Sims, who was writing back in February, was hopeful that the New Zealand NDC would be strengthened to be more ambitious, given that the sum of the 2015 INDCs “collectively would lead to an untenable 2.7 – 3 degrees Celsius future, rather than restrict global warming below the internationally agreed 2 degrees Celsius above pre-industrial levels” He seemed to have some hope that the then yet-to-be published Royal Society climate mitigation report would contribute to that. So does that mean the Government will actually do something to reduce domestic emissions? Perhaps toughen up the emissions trading scheme, so that it uses only New Zealand units and has a fixed cap (as in ‘cap and trade’), and auctioning units instead of free generous allocation of units to industry? No, of course not! “We have assumed that New Zealand will be able to purchase sufficient international emissions reductions in the 2020s”. “The (Paris) Agreement provides for a centralised market mechanism and also allows other approaches to be developed by Parties. When and how the centralised market mechanism will be operationalised is unclear, and it may not provide a timely and sufficient supply of emission reductions to be economically practical for New Zealand’s use.”. So no pressure, New Zealand! The analysis then lists the many steps/obstacles on and in the way of New Zealand having access to functioning international carbon markets. “This means that New Zealand will likely need to build future international markets from the bottom up in cooperation with other willing participants. New Zealand must: find willing trading partners, develop standards (including working with others) to ensure international carbon markets can function effectively (eg, on environmental integrity and unit registries), ensure that its trading activities are consistent with any future accounting requirements”. Where have we heard that before? Back when I looked at the creative accounting for the 2020 emissions reduction target. Surely, if the Government says it intends to adopt a mix of policies, one of which is domestic emission reductions, then some domestic emission reductions will actually happen? Well perhaps we could look for the reductions in domestic emissions in the Ministry for the Environment’s projections of future emissions “with measures” and “without measures” out to 2030. These are in the report New Zealand’s Second Biennial Report under the United Nations Framework Convention on Climate Change released in December 2015. This is the report where the only substantive differences between the with and without energy sector projections were the closure of the Huntly Thermal Power Station which then got reversed. Thus cancelling the projected decline. At the time of their release in late December 2015, Radio New Zealand reported the complete inconsistency with the freshly-signed Paris Agreement; Emissions set to far outstrip Paris target. And they quoted an expert. Here is a chart of these incompatible projected emissions from 2013 to 2030 by sector. The emissions for all sectors are all expected to increase. For the land-use, land-use change and forests (LULUCF) sector, the net carbon absorbed (or sequestered) is displayed as negative emissions and is projected to decline. Here is another chart of the projected gross emissions (without LULUCF) and the LULUCF carbon sequestration (shown as negative emissions). The LULUCF ‘credits’ are subtracted from the gross emissions to get net emissions (the red line and dots) which is the real measure of what gets into the atmosphere. Note that the forestry sequestration is declining towards zero through the 2020s, but is still a net ‘sink’ of emissions. However, wasn’t there meant to be a ‘wall of wood’ in the 2020s? Of wholescale harvesting or land-use change of the 1990s pine forests that would tip the net carbon sequestration from the forests into being a net source of deforestation emissions in the 2020s. Paul Young of the Morgan Foundation has looked at the issue and has concluded that the Government is pushing to change the rules used for accounting for forest carbon. We can look at this issue by comparing the current (December 2015) projections for the forests/LULUCF sector with the previous projections that were in the 2013 Sixth National Communication. It seems very obvious that the Ministry for the Environment have used a very different definition of sequestered forest carbon in 2015 from the definition used in 2013. By my calculation they have found an extra 248 million tonnes of carbon in the decade from 2020 to 2030. That change in accounting treatment has changed the ‘sign’ of the signal. A decade of net deforestation has changed into a decade of net storage. That is in spite of the fact that the wall of wood of harvesting is still is still expected to happen in the 2020s. Paul Young is also still concerned the the Government has not ruled out using the surplus emissions units to comply with the 2030 target. It’s not mentioned in either the Cabinet paper or the National Interest Analysis, so I asked Minister Bennett’s office that question and I am waiting for a response. Time for a conclusion. Is the New Zealand ratification of the Paris Agreement going to help or hinder the agreement’s ambitious goals? The ratification reveals that New Zealand will be doing what it’s always done under the UNFCCC. New Zealand’s greenhouse gas emissions are expected to rise and our policy response is more creative accounting and more forest fudging. Our speculative utopian techno-fix is emissions trading. The New Zealand Government simply has no policies for reducing domestic emissions, let alone in a way consistent with a fair share of a 2 degrees Celsius carbon budget.